. 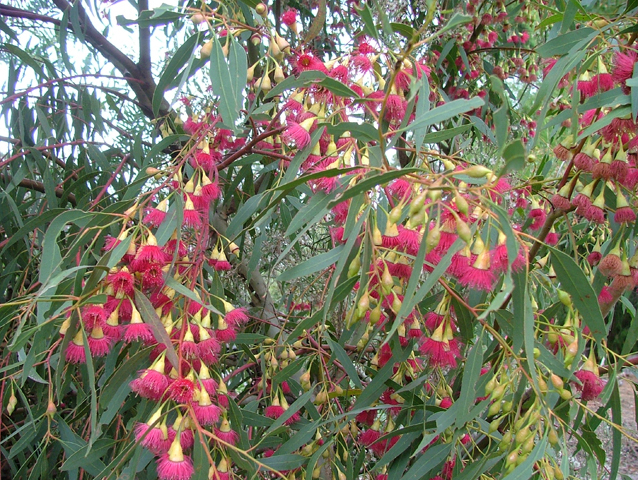 : Riverina Wildflowers Native Nursery, Plant Lists :. Tall slender palm tree, bright green fronds. Local species, dense pyramidal shaped tree. Large spreading tree, glossy green leaves. Tall tree, pinnate leaves, white flowers. Medium tree, glossy weeping green leaves, white flowers spring - summer. Spectacular tree, glossy dark green leaves, orange-red flowers in whorls late spring - early summer. Local species, pendulous green foliage, pale yellow flowers, most soils. Ornamental tree, new bark salmon pink, many white flowers late spring - early summer, most soils. Medium tree, weeping habit, clusters of white flowers spring. Medium tree, yellow flower spikes summer-autumn. 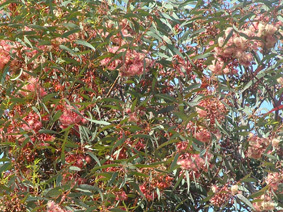 Spreading deciduous tree, pink flowers late spring-early summer, suitable most soils. Medium tree, partly deciduates late spring, red flowers during early summer. Deciduous tree, cream-white flowers spring. Local species, dense crowned tree, small cream-white bell shaped flowers, most soils. Semi-deciduous tree, small white flowers, suitable most soils. Local species, rough bark, narrow leaves, most soils. Local species, weeping habit, most soils. Large attractive tree, white flowers spring, smooth white - pale grey bark, aromatic lemon-scented leaves. Medium tree, flaky yellow-brown bark, leaves green, white flowers, most soils. Comapact small to medium tree, masses of large showy white flower spring. 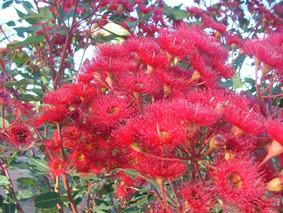 Medium tree, large red-orange-pink flowers December - January, most soils. Large tree, smooth mottled grey bark, white flowers, most soils. Medium upright tree, light grey bark, leaves silvery grey, white-cream flowers summer - winter. Small branched mallee, green foliage, purple-pink-mauve flowers, suitable most soils. Local species. Large upright tree, flowers white. 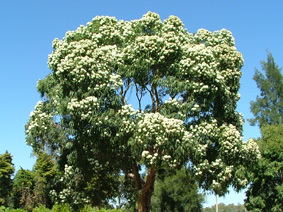 Large erect tree, white flowers, suitable most soils. Erect medium tree, drooping branches, smooth white bark upper branches, grey rough barked trunk, white flowers. Small tree, large green leaves, bright yellow flowers with red caps, most soils. Small erect tree, blue-breen foliage, smooth pale brown bark, pale yellow flowers winter. Small to medium tree, very floriferous, salmon pink flowers September - October. Small mallee with compact habitat, large pink flowers, well drained soils. Local species, large tree, small white and at times pink flowers, wet conditions. Small tree, profuse pink-red flowers in April-July. Most soils. Local species, large tree, white flowers, drooping foliage, most well drained soils. Medium sized tree, light brown-grey bark, ovate to oval blue - grey leaves, white flowers spring - summer. Local species, medium tree, small white flowers, most soils. Medium tree, dark green leaves, white flowers, most soils, damp conditions. Tall tree, white smooth bark, white flowers, most soils. Fast growing large open tree, smooth salmon coloured bark, small cream flowers. 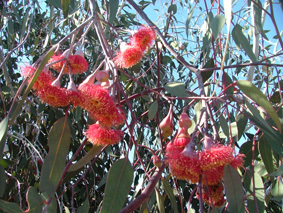 Attractive multi-stemmed mallee, smooth grey green bark and bluish green leaves, with cream flowers. Medium tree, grey to black bark, grey-blue foliage, flowers pink, most soils. Small tree, clusters of yellow flowers in summer, most soils. 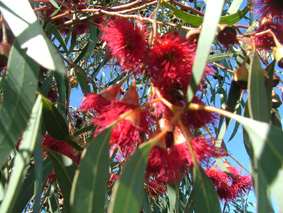 Small tree, rough grey bark, red-pink flowers any time of the year, most soils. Ornamental small to medium open tree, smooth white bark, white - cream flowers in summer. Local species, hardy slender mallee, dark green narrow leaves, white flowers, most soils. Ornamental medium upright growing tree, drooping grey-blue foliage, profuse yellow flowers during July -September, most soils. Tall straight pyramidal shape tree, green pinnate leaves, golden flowers, most soils. Small tree, fragrant cream-yellow flowers spring. Medium tree, dense crown habit, dark green leaves, white flowers spring. Small tree, white flowers, late spring-summer. Rounded shrub, attractive foliage, small heads of yellow flowers spring - summer. Rounded shrub, narrow leaves, apricot flowers in spring - summer. Local species, small tree with a weeping habit, creamy yellow flowers spring.